Rainy Days for the Indoorsy | Small, but valuable. I hate saying that I’m indoorsy. Sure, it’s a fun word, but I want to be outdoorsy. I want to be athletic and adventurous and all sorts of fun things. But honestly, I would rather curl up with a book on a soft chair most days. You get to enjoy all the benefits of a good author’s adventures without any of the inconvenience of real adventures. And if you end up falling asleep and napping for an hour, so much the better. There is one perk of being secretly indoorsy, however. It makes rainy days wonderful. And weeks that call for rain all week long? Even better. Rainy weeks mean that for several days in a row, I can stay inside guilt-free. I don’t have to worry about the 10,000 weeds in the yard that are growing feet a day because of all the rain. I don’t have to think about the running that I should be doing (well, not too much). 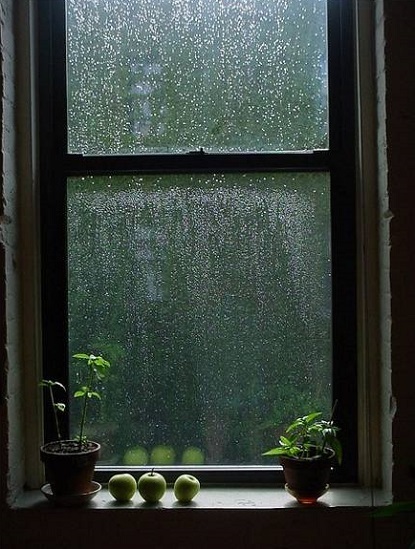 I can just do my inside projects and enjoy the sound of rain outside. Do I feel vaguely bad that the weather I love makes our dog absolutely miserable? Yes. Do I worry about that? No.